I am so honored this week to be invited down to an event celebrating veterans at the Library of Congress in Washington DC. 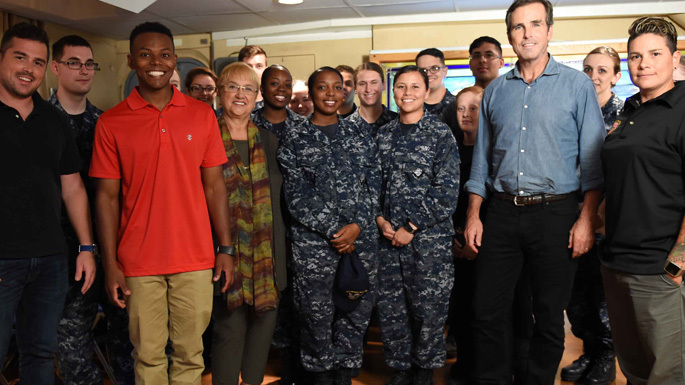 I truly believe that the veterans I met while filming my series Lidia Celebrates America are all heroes, in every sense of the word. I felt privileged to spend time with them and to now consider them all my friends. I feel grateful every day for what they have done for us, the sacrifices they’ve made. In an effort to give back, since my language is food, I cooked with many of them. I also got the chance to cook aboard the USS George Washington in Norfolk, Virginia where I cooked for 250 active duty sailors. One recipe they seem to love was a Roasted Pepper Halves with Bread Crump Topping. I hope you’ll love it too. I’ve updated this classic a little by using fresh thyme. If you like, you can substitute, or add, dried oregano. Chopped anchovies make a nice addition, too. Preheat the oven to 375 degrees. Drizzle the bottom of a 13×9 baking dish with 1 tablespoon of olive oil. Cut the peppers in half through the stems. Pull out the cores, stems, and seeds and using a pairing knife, cut out the ribs. Arrange the peppers side by side in the prepared dish. Drizzle 1 tablespoon of the oil over the peppers and season them with salt. Stir the bread crumbs, the remaining 3 tablespoons of oil, the grated cheese, 2 tablespoons of the parsley, thyme and crushed red pepper together in a small bowl. 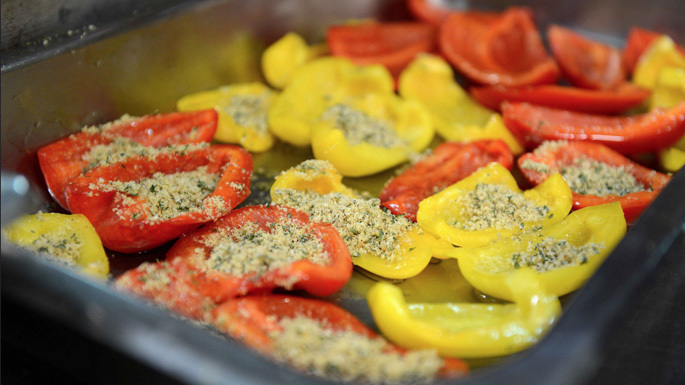 Divide the crumb mixture among the peppers, making an even coating over the pepper halves. Pour in the stock and cover the dish tightly with foil. Bake until the peppers are tender, about 20 minutes. Remove the foil and continue baking until the crumbs are lightly browned, about 10 minutes. Transfer the peppers to a serving platter, stir the remaining 1 tablespoon parsley into the juices in the baking pan, then spoon the juices over the peppers. Serve the peppers hot or at room temperature.